Home » The Dark Side Of The Moon: What Is It? What’s On It? The Dark Side Of The Moon: What Is It? What’s On It? Have you ever heard about the “dark side” of the Moon? 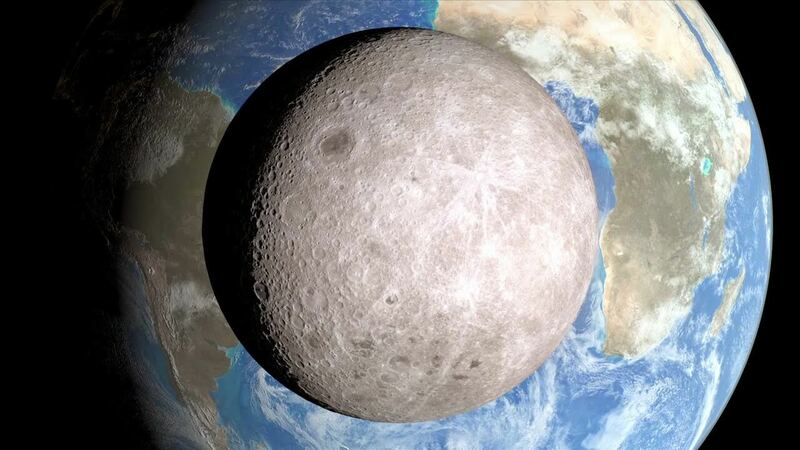 It’s the portion of the Moon that is permanently turned away from the Earth. Obviously it still receives sunlight, the name is not meant to imply that it doesn’t. The reason why we can never view this side of the Moon from Earth is because the time it takes for the Moon to rotate once is the same amount of time it takes for it to orbit around the Earth, approximately 27 days(5). The Moons rotation and revolution speeds are exactly synchronized, so from Earth’s point of view we always see the same side of our rotating Moon. Coincidence? Maybe not. It’s also reasonable to note that the theories about the Moon’s existence are highly questionable, given the physics alone it’s impossible to know how it came to be. Theories regarding the creation of the Moon have very little evidence to back them. Theories of planetary collisions giving birth to objects with such characteristics and perfect placements are highly unlikely given what we know about physics. Many scientists have pointed this out over the years and many of them agree that how the Moon came to be is a complete mystery. Members of the Soviet Academy of Sciences (Vasin and Shcherbakov, 1970), run by the Russian Government, published an article titled “Is the Moon the Creation of Alien Intelligence?” This article offered another explanation for how the moon may have been created. This seems to be a better hypothesis, because there is actually a considerable amount of evidence that points towards something suspicious happening on the Moon. When more people started to ask questions about some sort of presence on the Moon, the most common response was the fact that it would be impossible. That amateur astronomers, given the technology today, would be able to identify such claims with ease. This response is only half valid, given the fact that they would only be able to observe one side of the Moon! A lot of information is available to suggest that there are some sort of structures on the moon and also some type of operation occurring that’s unknown to the majority of people on planet Earth. They could be human operations, extraterrestrial operations, or joint human and extraterrestrial operations. If you are going to hide something from the eyes of astronomers, the “dark side” of the Moon is the perfect place to do it. Let’s take a look at some of the evidence that suggests something is going on up there. Research conducted by Stanford university was successfully able to identify the rings around Jupiter before science could confirm them. Before the NASA pioneer 10 was about to flyby Jupiter, remote viewer Ingo Swann was able to describe the same characteristics illustrated by NASA’s pioneer 10 by remote viewing the planet (2). Remote viewing is the ability of individuals to describe a remote geographical location of up to several hundred thousand kilometres (even more) away. It’s like projecting your consciousness to another place outside of your body. This phenomenon has been confirmed by multiple studies(1)(0). The interesting thing about remote viewing is that it gained a high level of interest from the intelligence community and the programs have been wrapped with secrecy in the classified world within the department of defence for years. (0)(1)(2). Ingo wrote plenty about the Moon and his findings on it, the fact that this man was closely connected and often used by the intelligence community (2)(3) should sound some alarms in realizing the importance of his work. Also, the fact that he successfully remote viewed Jupiter before modern science could is astonishing. These findings were published by Stanford University (2). You can find out more about Ingo’s findings on the Moon in his book, Penetration. He describes large structures, lights, buildings and some type of humanoid presence. Ingo’s case isn’t the only one that holds a great deal of credibility. Not to long ago, Gary McKinnon performed the greatest military computer hack of all time. In 2002, he was charged and arrested for hacking US Army, Navy, Air Force as well as 16 NASA computers. What did Gary find? He found a list on “non-terrestrial off world officers” that had a rank. He was unable to tell if they represent the Air Force, Navy, Army, or neither. He also found multiple pictures of UFOs and lists of “fleet to fleet” transfers of materials from “ship to ship.” To watch a full interview with Gary McKinnon and Kerry Cassidy from Project Camelot, right before he started making headlines, you can click here. This interview became extremely popular and it led to Gary’s appearance on major mainstream news networks. Could they have been trying to divert attention away from this interview? I am glad to report that Gary has been recently cleared of all charges. Given that the above information is highly credible and verifiable, meaning that there actually was a remote viewing experiment conducted by Stanford University (and many others) involving Ingo Swann (2), and that Gary McKinnon did indeed perform one of the greatest military computer hacks of all time, it made sense to continuing exploring this topic. Here is testimony given in 2001 at the National Press Club. As part of the disclosure project created by Dr. Steven Greer, hundreds of high ranking military personnel came forward to share their stories. Below are a couple of whistle-blowers that speak about the Moon. I urge you to check out Dr Greer’s and Amardeep Kaleka’s recent film, the The Sirius Documentary. It touches upon some very important information. So what do you think rests on the dark side of the Moon? For some to say that we never went to the Moon is ridiculous. Sure, some of the Moon landings that were televised could have been faked, but the fact remains, we have been to the Moon and the real thing probably wasn’t televised. Thanks for reading, hopefully I’ve presented enough information for you to further your interest if interested. It’s a very fascinating subject with a lot more information on it than what is presented in this article. I don’t know if this is real, but it fits in perfectly with the article. Regardless, it engages the imagination, especially for skeptics, which isn’t a bad thing. UFO Day: What is World UFO Day 2018? What are the strangest alien sightings?